It’s the most wonderful time of the year — Hot Chocolate season! 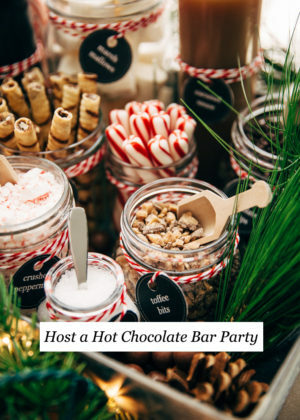 Let’s talk about how to throw a hot chocolate bar party with everything that you need and a recipe for the most luxurious hot chocolate that requires you to just toss everything into the slow cooker! Spread that holiday cheer! Welcome to the brand new designed site! And today, I’m also showing you how to host a hot chocolate bar party and sharing a recipe for the most luxurious hot chocolate recipe that you barely have to lift a finger for and and and there’s so much for you to explore on the brand new, easy to navigate site! So really, it’s like the best day ever! Also, I have a little update on the home decorating front. The curtains are officially up! A very nice gentlemen came over on Friday morning and install the dreaded 18-foot curtains. Thank the Lawd. So happy to have a second item crossed off of that list. Those high ceilings were what sold us on this place and they’ve been a big pain in the bumpy since then. And just hours after the curtains went up, the site went down to get a nice little facelift. You’ll notice we have a brand new ‘life’ section where I’ll be sharing new posts on travel and just general shenanigans around here! 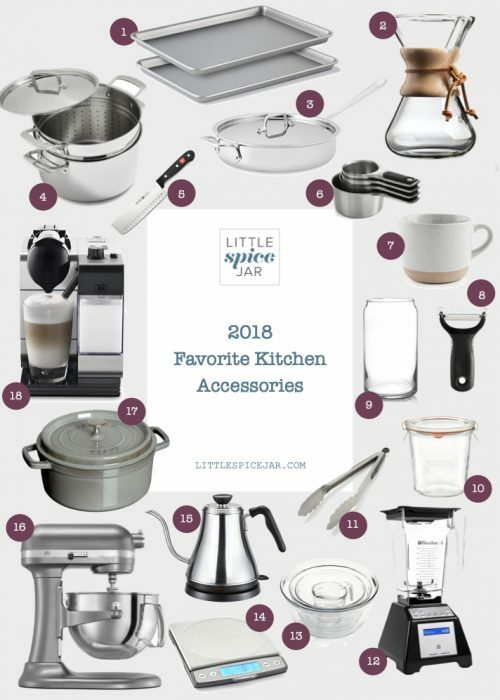 Also, we have a new ‘shop’ functionality where I’ll share some of my kitchen favorites. I get asked a lot about what kind of this and that I’m using and now there’s a home for it and you can easily check them all out in one place. You can also rate the recipes now. So if you love this hot chocolate recipe or one of the other ones, be sure to leave a little comment love. You’ll be happy to know there’s a *working* print button now!? I can’t even tell you how many emails I got about that. It works on most of the newer posts, so please, print away! 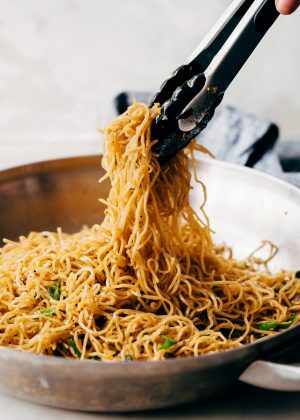 The last thing, we are still converting a lot of the recipes over from the old format, so while the new recipes can be printed, the older ones will take a little longer to get there. Some of the older recipes are missing, we’re working to get them back up shortly. 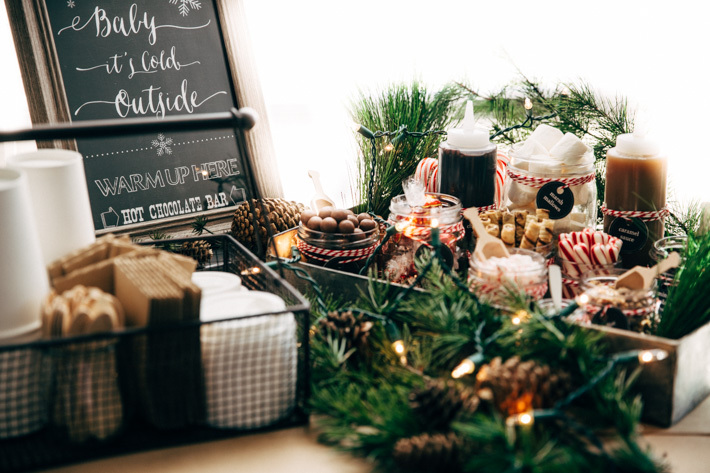 This coming year, I wanted to start sharing some crafty sort of ideas with you guys and couldn’t think of a better way to start than with a DIY hot chocolate bar. I’m not saying this is becoming a regular thing or anything but you know, once in a while when inspiration strikes, why not? 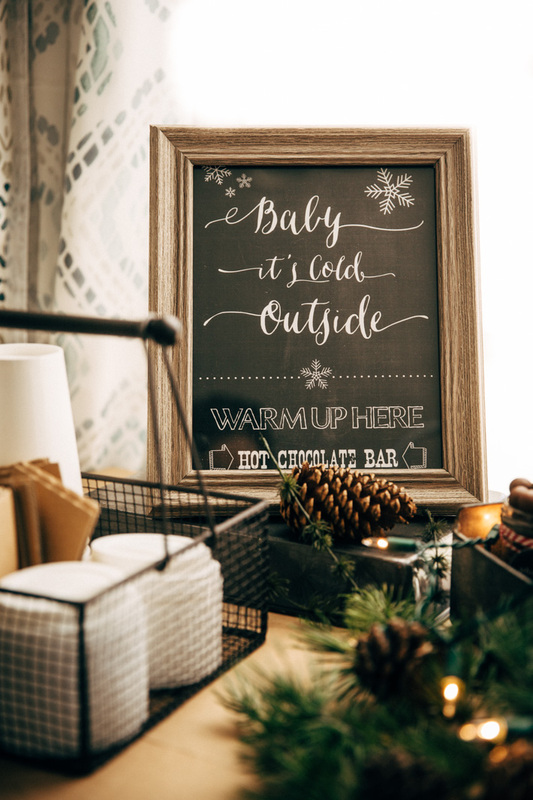 And hot chocolate bars are all the rage right now, you see them at weddings, holiday parties, work parties, birthdays, cookie decorating parties, so on and so forth. The inspiration for a hot cocoa bar struck when I started helping one of my dear friends plan her sons first birthday party. I’m still in shock the little guy is about to turn one. The first day of this year is when we hosted her baby shower. Oh, how time flies! She’s going with a Lumberjack themed party. How cute is that? And that’s when it all started coming together. I love the idea of winter parties with a theme, so today I’m sharing my rustic log cabin themed hot chocolate bar. Let’s start with everything you need for the table and then I’ll share with you that heavenly hot chocolate recipe. It’s made with REAL melted chocolate and you just won’t believe how easy it is! To kick things off, let’s talk about paper goods. These days you can buy adorable paper coffee cups like Starbucks right on Amazon! They come complete with sleeves and lids. 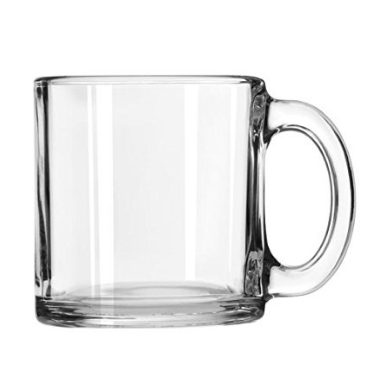 Of course, you can also use nice mugs if you’re hosting a party for just a few people. Maybe even customize the mugs if you’re fancy like that? That would make for a nice Christmas present or if this is for a wedding, they could be wedding favors! You can also purchase customized paper coffee cups if you want a message on them. The interweb is such a wonderful place! To stir the hot chocolate, I set out wood spoons. These ended up being a little shorter than I anticipated but I doubt anyone would drink a 12-ounce cup full of hot chocolate so I think they’ll be just fine! 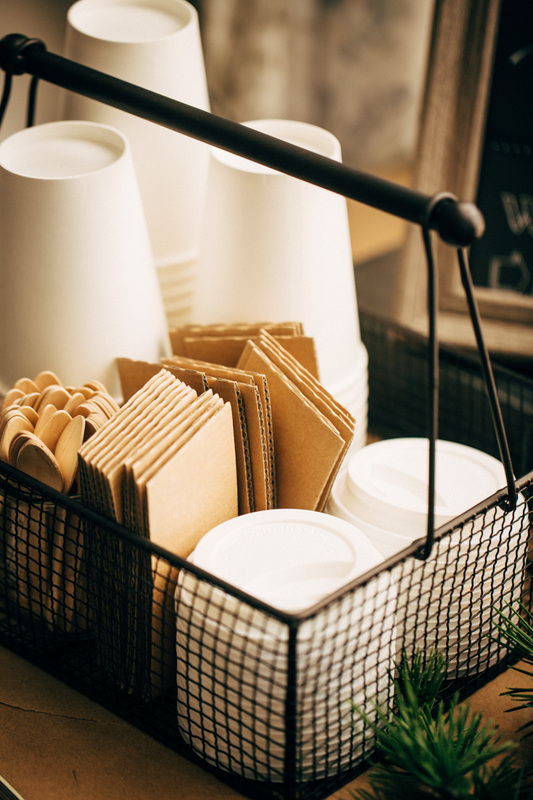 Another great alternative would be these coffee stir sticks. For the hot chocolate bar toppings, I used mason jars in different sizes. I like to use a variety of sizes to really add some height and interest to the whole thing. Use a few tall ones for jumbo marshmallows, a few short ones for toppings like toffee bits, and mini ones for coarse sea salt. And how are your guests gonna get those toppings out? These scoops, so tiny, so flippin’ cute! To make the jars look a little more festive yet still be with that rustic theme, wrap red bakers twine around the jars a few times. The labels were a breeze, I printed them on cardstock right on my home printer. I’ll add a link for these below with other printables for the hot chocolate bar. And every hot cocoa bar needs a good sign. I bought this faux wood frame for $6 at Walmart and printed the sign at home. Here’s a link to this sign. You’ll need to sign up for their mailing list though. Once you do that, you’ll get an email with a password to download the printable. But it is completely free. You can also make your own sign on chalkboard paper that you can print and here are directions on how to do that along with fonts that would look good. I used blank jar labels to make the signs for the toppings. Photoshop works great to type the names of your toppings. You can also print blank labels and write the toppings in with a white pen or chalkboard marker. Also cute, print labels with the names of your guests on there! 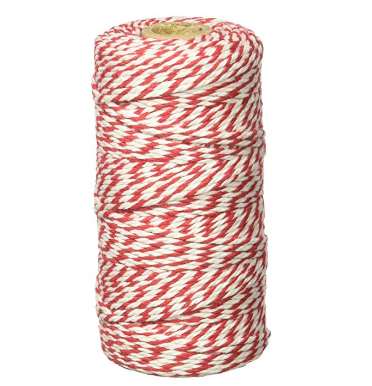 Use that same baker’s twine to tie it around the sleeves of the paper cups! As far as decorations, you can use just about anything you like! Sticking with the rustic, log cabin theme, I used a large galvanized metal tray that I picked up from Hobby Lobby during their 50% off sale for $7 to place all my hot chocolate bar toppings in. It’s possibly one of the best props I’ve ever bought. The paper goods basket is also from there. A large bag of these winter scented pinecones from Michaels, just scattered around. $2.50 for a huge bag is a steal! The brown paper is a large roll I picked up from Home Depot from the paint section, in the ballpark of $3.50. A string of white lights around faux evergreens adds a little more color and brings the outdoors in. The faux pine branches are from Hobby Lobby as well, they were 50% off and I paid about $2.50-4 per branch depending on the style. Light a few pine-scented candles, put the fireplace on, and little holiday music. If it’s snowing where you live, I’m totally jelly. Draw back the curtains and let that powdery goodness show through. Moving on to the other main attraction — the hot chocolate. You already know I’m a YUGE fan of slow cooker recipes for hot chocolate. I shared a peppermint version and Mexican hot chocolate with you guys in the past. Today I wanted to bring you the ultimate recipe for homemade hot chocolate in the slow cooker. It’s simple, straightforward, and uses real chocolate. We start by whisking together a little cocoa powder and hot water in a bowl. 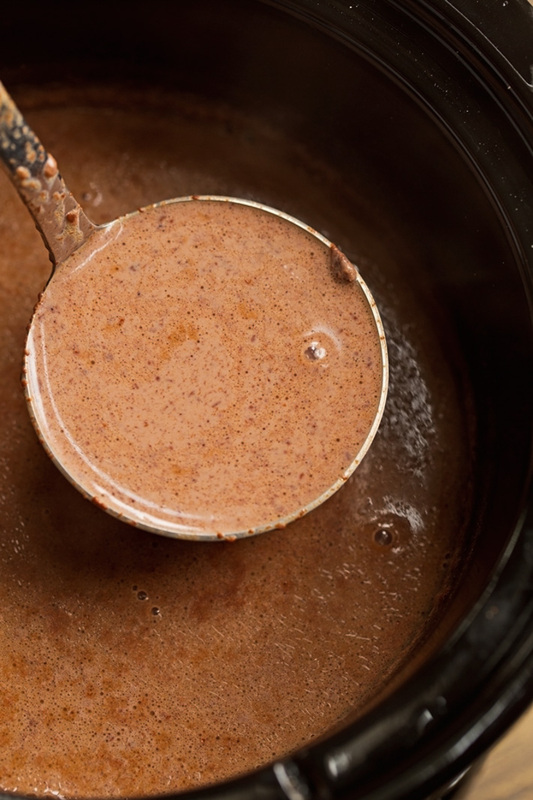 When the cocoa mixes in, add it to a slow cooker along with chopped chocolate, milk, heavy cream, a can of evaporated milk, sugar, and a hint of salt. That’s it! Let it go low and slow for 6 hours or on the high setting for 4 hours. As always, you want to whisk the hot chocolate every now and then to make sure the chocolate isn’t stuck to the bottom. 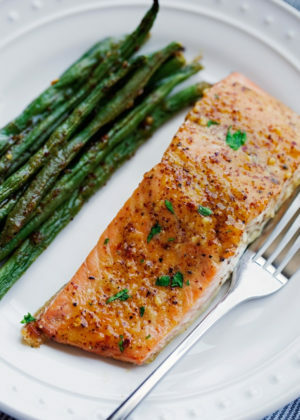 You can also make this on the stove if you don’t have a slow cooker. Just whisk the water and cocoa powder together over medium heat until it begins to simmer, add in the remaining ingredients and whisk until the chocolate melts. Make sure the hot chocolate doesn’t boil. You want it to just barely reach the simmer point. It’ll take you in the ballpark of 15 minutes altogether. A couple of things I want to bring to your attention. Use chopped chocolate and not chocolate chips. I’ve used chocolate chips in the past and it’s a hit or a miss. Sometimes it melts, other times it’s a pain. For best results, I really suggest chopping up chocolate bars. The second important thing, don’t skip the evaporated milk! I made this hot chocolate recipe for a few friends when I was still testing it and it got rave reviews! The evaporated milk is wonderful with the melted chocolate. Seriously, it’s magic. Lastly, the sugar is optional. I actually wouldn’t add it in if you’re serving it with a hot chocolate bar. The toppings are super sweet as it is so it really isn’t necessary. If you’re serving this without toppings you may want the sugar. 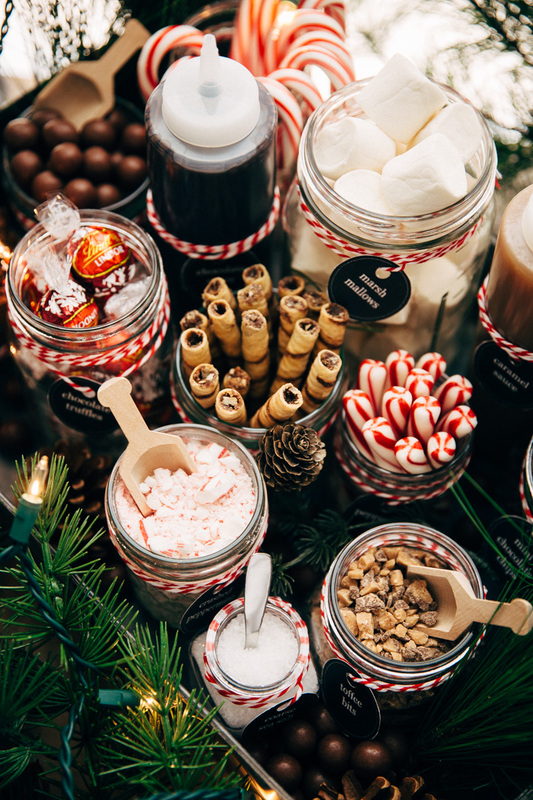 Promise me you’ll have more hot chocolate bar parties this holiday season. Pro tip: a cup of hot chocolate + 1 single Lindt truffle. Stir until it melts. 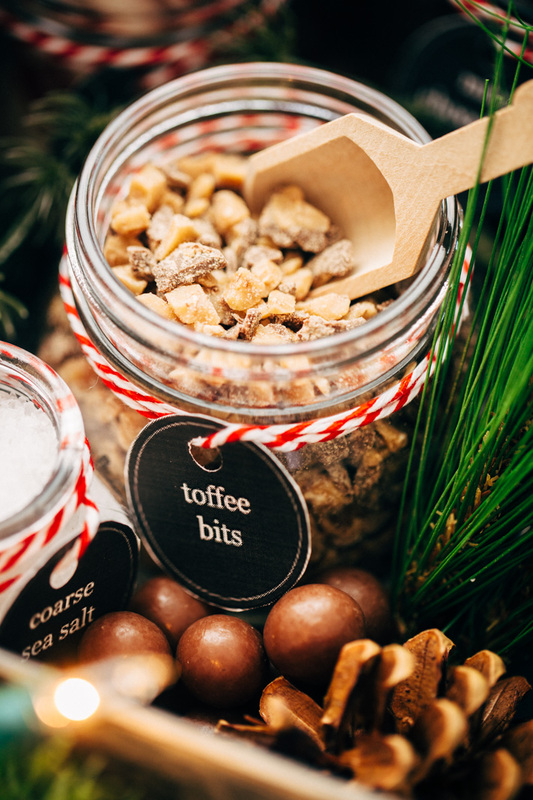 toppings: marshmallows, toffee bits, coarse sea salt, mini chocolate chips, crushed peppermints, candy canes, soft peppermint sticks, whoppers, lindt truffles, pirouette cookies, whipped cream, dark chocolate syrup, caramel sauce + whatever else you fancy! Start by adding the cocoa powder to a bowl, pour in the hot water and whisk until mixed. Add the cocoa mixture along with the chopped chocolate, milk, heavy cream, evaporated milk, and salt to a 6 quart slow cooker or larger. 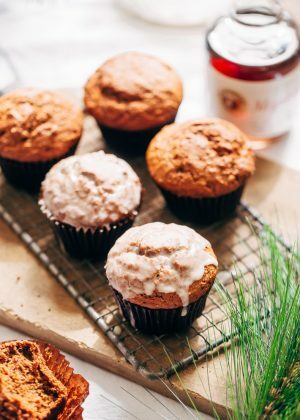 If you’re serving this with a hot chocolate bar and toppings, consider leaving out the sugar to avoid the hot chocolate being too sweet. If you’re serving the hot chocolate solo, add in the sugar. Cook the hot chocolate on the high setting for 4 hours or on low for 6 hours. Low for 6 hours is what I prefer. 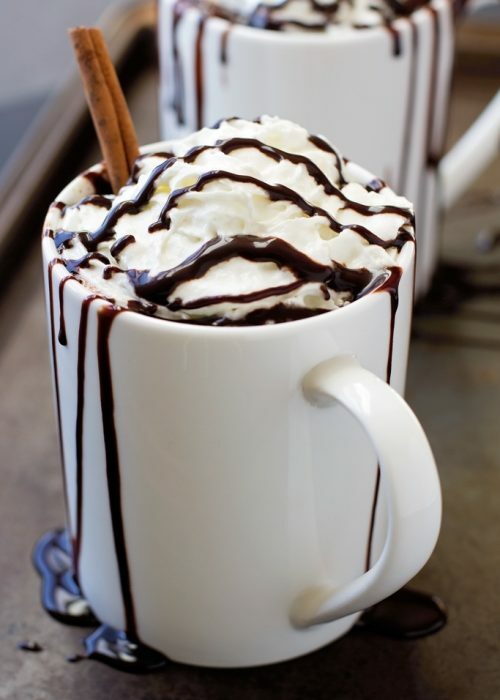 Make sure to stir the hot chocolate every hour to keep the chocolate from settling to the bottom. 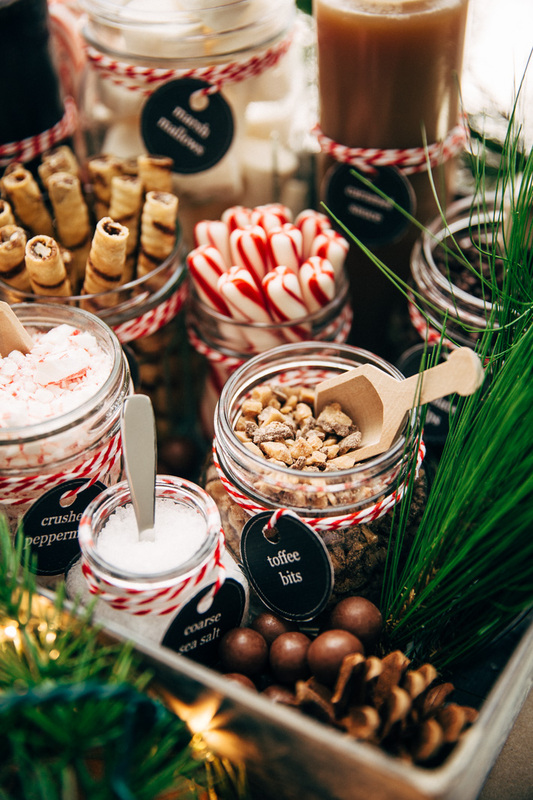 Keep on the warm setting if you’re serving it hot chocolate bar style with toppings on the side. Leftover hot chocolate can be refrigerated for up to one week and warmed in the microwave before serving. Once the hot chocolate cooks, you want to try and serve this within 1-2 hours. 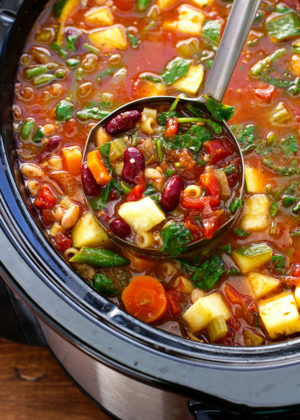 If you let it sit for too long, and your slow cooker runs hot, you run the risk of it curdling or sticking to the bottom. Oh please don’t make hot chocolate with anything less than 2% milk, it just won’t give you that deliciousness. Also a no-no, fat-free evap milk. 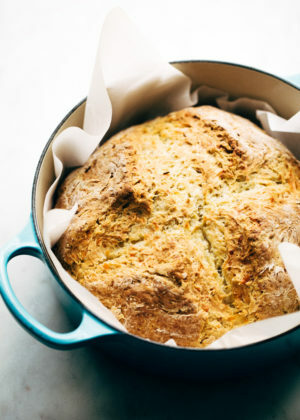 You can halve this recipe to serve 7-10 guests. Yes, making it a day ahead and reheating it should be fine; I’d keep it cold and then just reheat on the warm setting for at least an hour. Enjoy! I made this for an ugly sweater party last night, 12/22/18. I used 12 ounces of Hershey’s semi-sweet baking bars and 8 ounces Nestle Toll House semi-sweet morsels. I found this to be extremely chocolately and sweet. However, the concept was good and, by adding some extra whole milk, it was really good. So fun to select the toppings! Overall, definitely a crowd pleaser for both adults and kids. 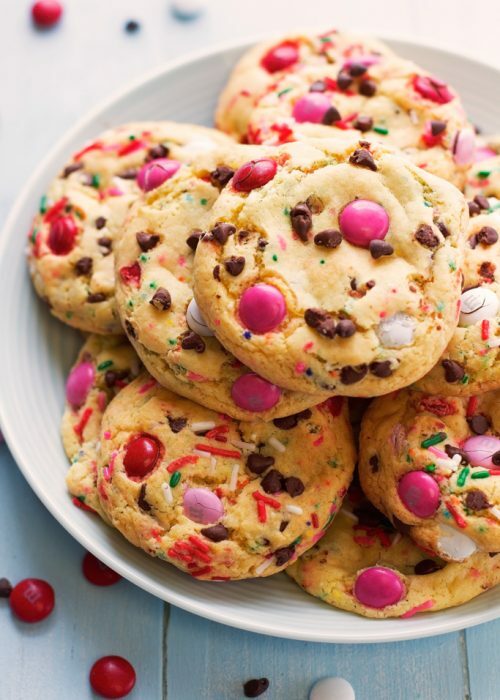 Has anyone else used chocolate chips? I bought them by mistake and now I don’t have time to go back to the store. I also don’t want to ruin the recipe. Help! Make a ganash of the chocolate chips and evaporated milk, it works great! Dump the chocolate chips and the evaporated milk into a microwave safe mixing bowl, microwave for 1 minute, stir, then in 30 second intervals stirring well between each until everything is kind of a thick syrup then add that to the crockpot with everything else and zero problems with no melting! Be sure to mix really well between microwaving though, you don’t want the chocolate to scorch. 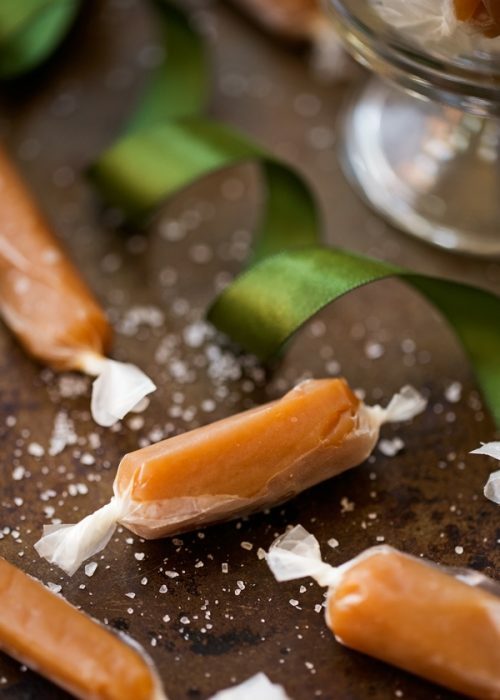 I love this recipe, I make it several times every Christmas season. Thank you Marzia! Question- Can I combine semi-sweet chocolate chips with the bars? I have some chips I would like to use up and wondering if I can combine the two? Thanks! 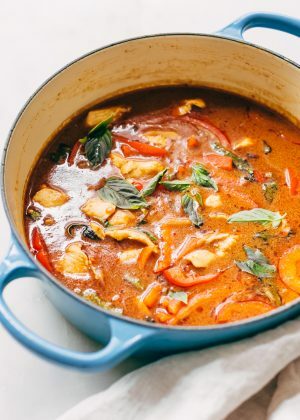 Excited to try this recipe this weekend! I have to make two! 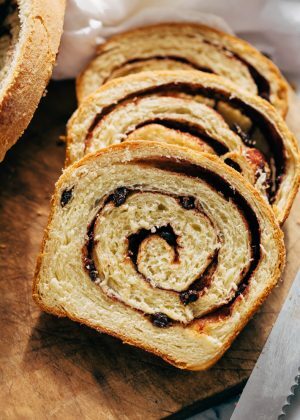 Fabulous recipe and design ideas! Made it. Loved it. I’m planning to make this for my daughter’s birthday this weekend 🙂 How many does it serve??? We’ll have 25 people, should i double it? 20 oz chopped semi sweet chocolate, plz explain ???? Baker’s Bars? Can it be made with milk chocolate? Then what do I melt? Hershey’s candy bars? Can I mix the semi sweet and milk chocolate? Heavy cream — is that whipping cream? Thank you, LOVE the idea!! I am totally doing this! I love this idea! Can’t wait to do this at my daughter’s wedding reception in Jan.!! 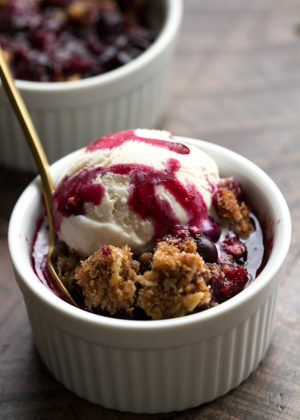 Tested this recipe out today for an upcoming ice skating 8th birthday party this weekend 🙂 Overall the recipe was amaaaaazing! However, ours burnt at 5 hours on low in the slow cooker (but we taste tested it during the various stirrings and it was delicious!). We made half a batch so that could be why, but this of course is exactly why I test first. 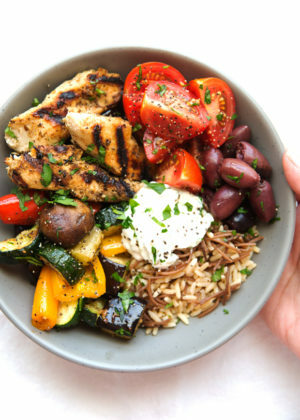 Will be making it for the party this weekend, just cutting the cooking time down. I will be making this for a Secret Santa Christmas for my daughter’s friends. I can’t wait to try it! Love this!! What do you serve your hot chocolate in? 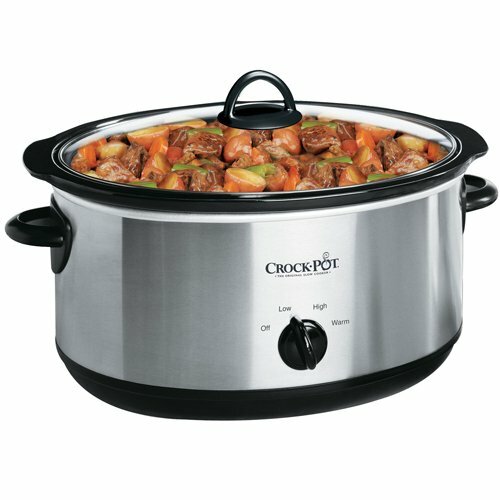 Do you serve it straight out of the crock pot? 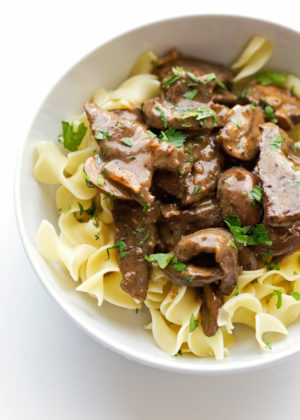 Yup, I served mine straight from the slow cooker as it keeps it nice and warm! You can also transfer it to a dutch oven or any large vessel, for that matter, if you’d like! Granted mine came out a bit more “woodland picnic hot cocoa” themed (had to work with decor I had on hand), but none the less I’m super proud of it and can’t wait to take it to the company Christmas party. Wish I could take a pic and show you the end result. Hi Grace, I’m so happy to hear you enjoyed the end results! I’d absolutely love to see a picture if you’ve got one! You can share it in a private message on Instagram or tag me in your picture if you’d like! Happy holidays and I hope everyone you share the hot cocoa with enjoys it to the fullest! I did a hot chocolate bar for my Christmas/gender reveal party last night and it was a huge hit! Everyone loved the hot chocolate and different toppings. The only thing I changed was I used less sweetened condensed milk, about 7 oz and it was plenty sweet enough. I used Ghirardelli semi-sweet chocolate chips and it was perfectly decadent. Some of my guests added more milk to their hot chocolate though to cut the richness. It should be evaporated milk, according to her list of ingredients. Some recipes online calls for sweetened condensed milk, but not this one. This might be why people added milk to cut the richness of the condensed milk. If you used the evaporated milk the next time it should turn out perfect. Thanks for noting that you used the semi sweet chips, I’ll do the next time. chopping all the bars was a pain. 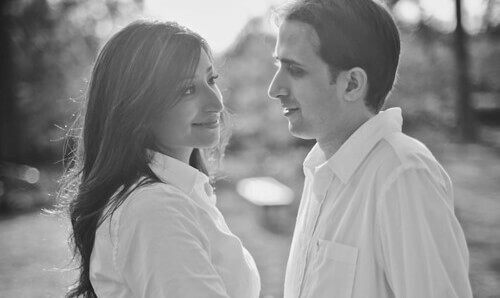 Love, love the new site! I am a big fan of the jump to the recipe button! Thanks for including that! This recipe just may have to go to work with me!! I think the office will be happy! I will wait for that cold West Texas wind to blow and surprise them! Glad to hear it Chris! Thanks for commenting!